Sydney’s West will become a new hub for shipping containers, as Royal Wolf has completed a $2.5million upgrade of its Moorebank customer service centre, merging its St Mary’s facility to form one state-of-the-art base, providing local residents and businesses access to a wide range of innovative container solutions. With modern architectural design, the centre is built to be environmentally friendly and features a first-class training facility to be used nationally by all employees and will service as a benchmark for all Royal Wolf sites moving forward. Viv Kennelly, Royal Wolf’s Executive General Manager – North & East, said combining the two operation centres will improve efficiency and increase production to the benefit customers in the region. “A larger warehousing space will allow us to fulfil more orders faster than ever, while a modern on-site spray booth will be used to deliver creative modifications and increased undercover roof space will ensure uninterrupted service in all weather conditions,” said Viv. “The site manages 70-80 transport moves a day, so its strategic positioning close to the M5 and M7 Junctions - with easy access to Moorebank’s upcoming Intermodal transport hub - will further strengthen our capabilities in the region.” “Whether it be accommodation and office units, hoardings and gantries for the construction industry, commercial kitchens, storage spaces, or event kiosks, pop-up bars and shops, restaurants and art exhibitions - we’re excited about what our team will be capable of delivering to locals and businesses looking to us for innovative solutions,” he said. 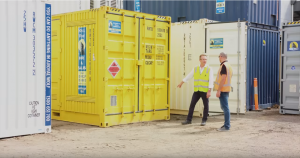 Services available at Royal Wolf Moorebank will include shipping container hire and sale, container accessories, delivery, finance options, the full product range, onsite storage and a display centre.